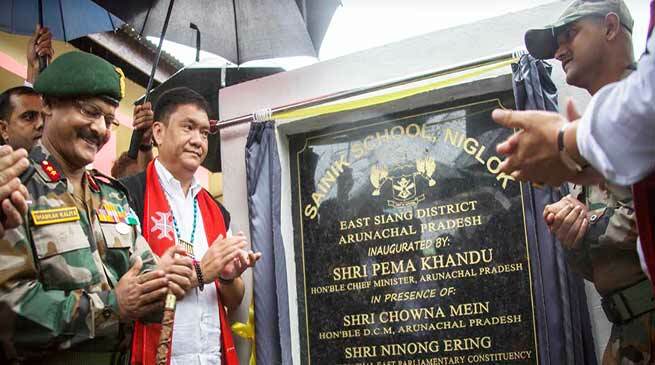 Arunachal Pradesh Chief Minister Pema Khandu today dedicated the Arunachal’s first Sainik School to the people of the state. Chief Minister Pema Khandu today dedicated the Arunachal’s first Sainik School to the people of the state here at Niglok. He said the state rightfully deserves Sainik Schools as Arunachali people are known for their patriotism, which is exemplified through greetings of ‘Jai Hind’ by the locals for the Jawans guarding the borders. He also said opening of Sainik Schools will provide opportunity for the youths of state to pursue for career in Armed forces and other prestigious career.